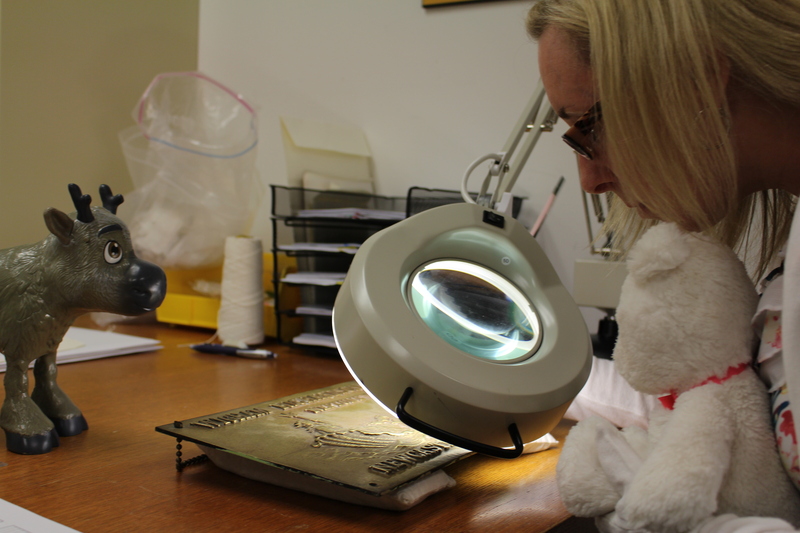 This week, Snowflake and Sven visit Tanya, the St. Catharines Museum’s Collection Technician – Artifacts. Tanya takes care of the 100,000 and counting artifacts in the museum collection. Tanya and her team of 10-12 volunteers catalogue newly accessioned artifacts – documenting their physical attributes, assessing their condition, and determining its relevance and significance to St. Catharines history. Each year, Tanya and her volunteer team catalogue between 1500-2000 artifacts! It’s an ongoing process integral to enriching the history of our community. Sven and Snowflake seem a little too interested in Tanya’s giant magnifying glass. Tanya is also responsible for preserving, packing, and storing the artifacts in the museum’s collection. There’s a careful science to this. Artifacts made of certain materials, like wood or textiles, are generally stored with other like-artifacts in order to help preserve their condition. 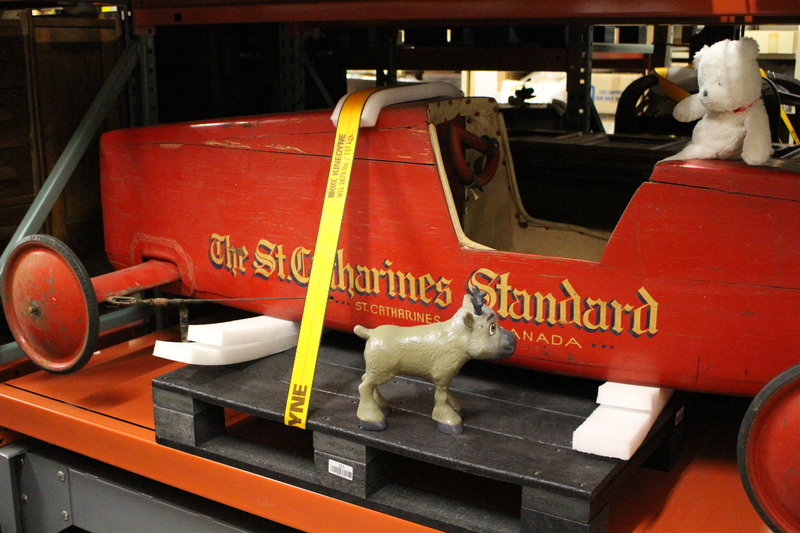 The St. Catharines Museum practices preservation, meaning that we work to maintain objects in their current condition. Part of an object’s story and meaning is in the condition they come to us in. We work to preserve that story and meaning as best we can. Snowflake is living the Soapbox Derby dream. Did you know that the Museum’s “Collections B” room stands for “Big Stuff”? We have over 200 oversize artifacts in our collection. Tanya’s favourite part of her job is that she gets to be up close and personal to the artifacts in the museum’s collection. She gets to know an artifact like nobody else – the texture of an object and how it feels, its smell, its physical details that others may miss. There is something very exciting about this – but also it’s great responsibility that Tanya takes very seriously! While Tanya gets to work with some really important artifacts that once belonged to really important people, like the portrait of William Hamilton Merritt, it’s the stories belonging to the relatively ordinary looking artifacts that she finds the coolest. One of Tanya’s most favourite artifacts in the museum collection is this pair of glasses. We can agree these are a very ordinary looking pair of spectacles, right? They look old, and maybe a little too small for anyone’s head today (except maybe Snowflake’s) – but nothing too extraordinary about the look of them. But the story we can tell with these glasses is what makes them so fascinating. These spectacles have a story. Can you tell just by looking at them? STCM 2007.20.23. Circa 1815, these gold-rimmed spectacles belonged to Paul Shipman. Shipman had a tavern at the corner of what is now St. Paul and Ontario Streets. The settlement that was originally dubbed ‘The Twelve’ was then commonly referred to as “Shipman’s Corners” as the tavern was a popular spot for residents and travelers to visit. Even after the town’s name was legally changed to St. Catharines, many still referred to it as Shipman’s Corners. Paul Shipman’s tavern was also the location of a very important meeting. After years of surveying and searching for investors, William Hamilton Merritt called his friends, investors and contractors to Shipman’s Corners. In 1824, George Keefer, Thomas Merritt, George Adams, William Chisholm, Joseph Smith, John Decew, William Hamilton Merritt and Paul Shipman incorporated the new Welland Canal Company. It is likely that Shipman was wearing these spectacles when he signed the Welland Canal Company charter. 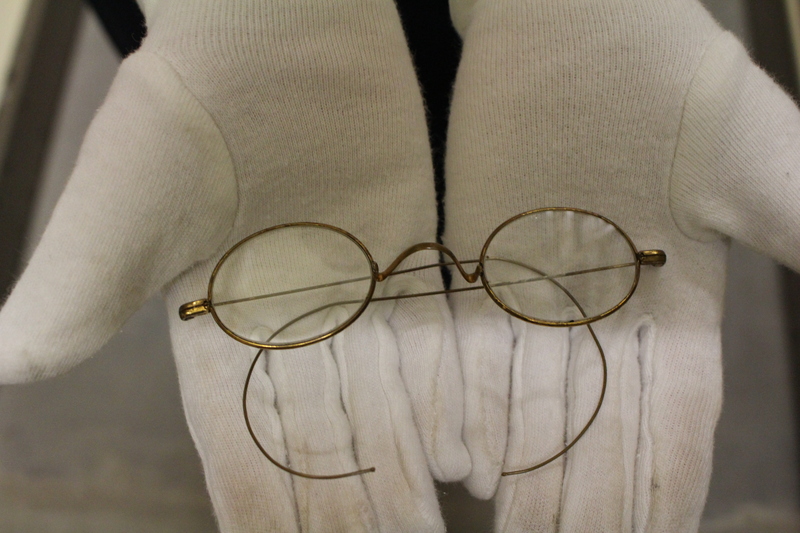 These spectacles -which are now in the care of the St. Catharines Museum. 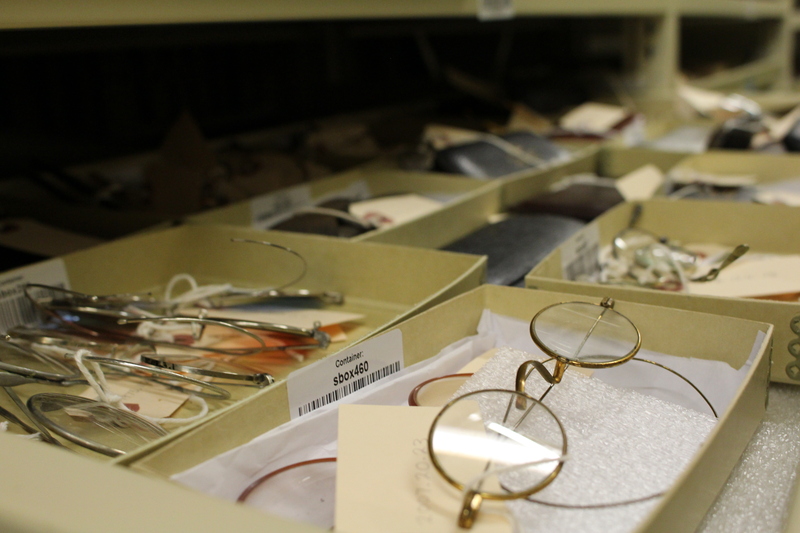 Shipman’s glasses are stored with other eye wear in the Museum’s collection. Imagine what Shipman would have seen through these spectacles – he saw history being made with the formation of the Welland Canal Company, he witnessed the building of the canal and the growth and development of his city. And now we can see this history in these spectacles. If you are interested in donating artifacts to the museum, please read our Donating Artifacts brochure and contact the museum directly. Help us tell the story of St. Catharines! Next week, Snowflake and Sven learn about the St. Catharines Museum’s super fascinating St. Catharines Standard Collection. Sara Nixon is a Public Programmer at the St. Catharines Museum and Welland Canals Centre. Sara thanks Tanya for her help in writing this post and for keeping Snowflake and Sven away from the giant magnifying glass. Sara and Tanya, thank you for this article. What a great artifact to highlight! Really explains how ordinary objects can bring history alive. Keep up the good work and the storytelling! Thank you very much, Bel! So glad you liked our article! Because I do not get to the museum as often as I would like to,…. I really enjoy and appreciate articles such as this one. Thank you. Looking forward to more posts like this. Thank you, Shirley! We’re excited to bring a new perspective of the museum to the public with this blog!